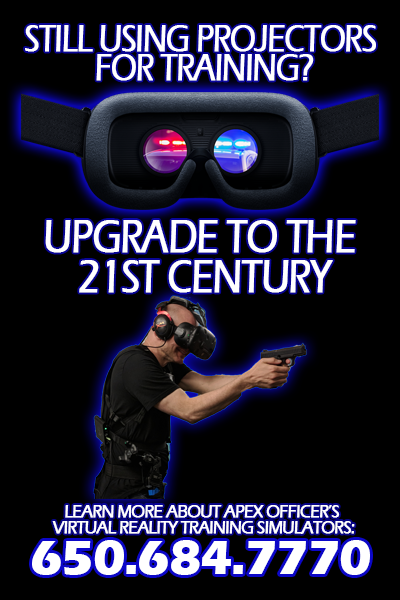 Upgrade to the 21st century and trade in your old simulator for a brand new Apex Officer virtual reality training simulator. Is your agency still using a projector based simulator for training? Apex Officer has you covered. For a limited time, trade in ANY projection screen firearms training simulator towards the purchase of a Apex Officer X1, Apex Officer X3, or Apex Officer X9 Pro Training Simulator. The old simulator you have collecting dust in the spare room is wasting your agency time, money, and resources. It's always broken and your officers hate using it. The training isn't dynamic and the technology hasn't improved in over 20 years. It's time for a fresh start. Receive $15,000 (USD) off of the Apex Officer X1, $20,000 (USD) off the Apex Officer X3, or $25,000 (USD) off of the Apex Officer X9 system with your trade in of any single screen training simulator. We accept ALL systems in trade, regardless of model or condition.